Mixing two popular visual-novel style gaming franchises together and forming a crossover game is definitely a unique and exciting concept. One which I believe has never been done before until this game. Professor Layton vs Phoenix Wright is a collaboration project between Level 5 and Capcom, combining gameplay and characters from both series’ to form a huge, thrilling story full of twists and turns, and an adventure that you will likely never forget. It should not come as a surprise to you when I say that Layton vs. Wright is, quite literally, a combination of the two series’. You’ll be exploring locations and solving puzzles in town, while in court you’ll be questioning witnesses and presenting evidence during cross-examination. 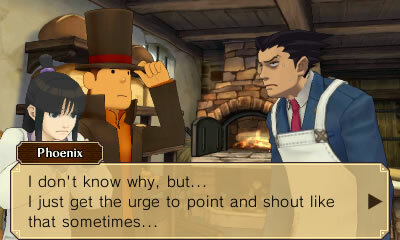 This game even takes soundtracks from the Ace Attorney games and “Laytonises” them, as well as introducing some new tracks to give the game a more unique feel. Layton vs. Wright really does feel like the next Ace Attorney game most of the time ; you’ll be spending a lot more time in court than in solving puzzles. However this isn’t necessarily a bad thing, the trials themselves are extremely intense, while the puzzles acts as pleasant bite-sized breaks of gameplay in between to mix things up. As stated before, when you’re not defending a witness in court, you are out and about exploring the world. As you have probably guessed this exploration is presented in a style that is identical to that found in the Professor Layton games; you will drag a magnifying glass around an environment to talk to people, look for hint coins, and locate hidden puzzles and to navigate to different areas. 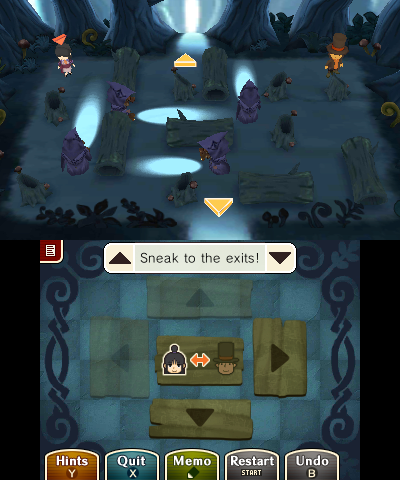 The art style of the locales and characters are a nice blend of both games and are incredibly charming to look at. 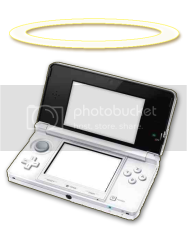 However ; the animation can lag during the final trial of the game due to the large number of characters on the screen at the time, but on the whole everything looks extremely smooth and natural. If you’re a fan of the Ace Attorney games you’ll find a nice change of pace during the Witch Trials in the fantasy medieval town of Labyrinthia. Stakes are incredibly high during those trials as Phoenix is in a world completely different to the real one, and must abide by the laws of a world where witches and magic exists. Alongside the familiar courtroom gameplay mechanics from previous Phoenix Wright games are some new ones. While you’ll still be pressing witnesses, presenting evidence and pointing out contradictions within statements, one of the major introductions in this game is that Phoenix is now able to question multiple witnesses. This gives you the opportunity to question other witnesses while one witness is giving his or her testimony, as they may yield more information or point out an inconsistency in the testimony they just heard. Should you ever feel stuck during cross-examination, you can spend a hint coin to point you in the right direction. This hint will tell you which statement to press or present, and grey out a number of evidences during the present phase to narrow down the answers. The hint system is completely option, but it’s nice that it’s there for anyone who finds themselves stuck (and can safely be ignored for those who wish to figure things out themselves). I cannot review Layton vs. Wright without mentioning the amazing soundtrack in this game. Each and every track is of extremely high calibre, especially those which are played during the Witch Trials, providing high tension and an intense atmosphere which, in turn, sets a certain tone within the world. The plot itself is a fantastic mystery that keeps you guessing and speculating throughout. I cannot comment on the specifics without giving too much away, so you will have to play through the game yourself if you wish to know, it is a visual-novel style game after all. But I can safely say you will not be disappointed with the outcome. 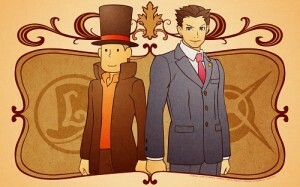 Layton vs. Wright took me 20 hours to complete, which is around average for a game of this style. If you find this game for £30 I definitely say pick it up, especially if you enjoy either or both of the Professor Layton and Ace Attorney series’.